Spaetzle (spätzle in German) are half dumpling half noodle looking delightful morsels made of dough that typically consists of flour, eggs, and salt. Some water is also usually added to produce a thinner dough. They are traditionally made by cutting little pieces of dough on a wooden chopping board and dumping them into boiling salt water where they cook until they rise to the surface. They are then skimmed and reserved for serving. Because this is a lengthy and somewhat awkward process, several devices were invented to replicate more easily the preparation of spaetzle. 3. Ricer (or Press) type (spätzlepresse). This article will describe all three types and provide product recommendations, so you can make your own delicious spaetzle at home. Please note: For best results as well as efficiency and durability, German brand spaetzle makers are best. The products recommended below are all German brands, but they can easily be obtained below on Amazon. A quick spaetzle recipe is given at the end of this article. The strainer type device uses a round, strainer like screen made of stainless steel or plastic with round cutting holes (0.3 inch in diameter). To prepare the spaetzle, the screen is placed on top of a pot of boiling water. The dough is placed on the screen, and with the help of a scraper it is pressed through the holes into the pot. As a result, tiny pieces of spaetzle will fall into the boiling water. When the spaetzle rise to the surface, they are skimmed out and reserved for serving. The German brand Kuchenprofi is no doubt number one when it comes to strainer type spaetzle makers. 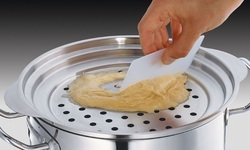 The Kuchenprofi spaetzle maker has a graduated rim that can fit securely over any size pot (see picture above. The included scraper is used to press the dough through the holes and into the boiling water in the pot. The 10.5-inch diameter unit is made of 18/10 stainless steel and is dishwasher safe. You can obtain your own Kuchenprofi strainer type spaetzle maker by clicking the provided Amazon product link. This tool consists of two parts: a rectangular plate with grating holes( that looks like a vegetable grater) and a small dough box. The dough box can slide back and forth in longitudinal tracks which ensure accurate guidance on the grating plate. The plate is usually made of stainless steel or plastic and has a length of about 30 centimeters (see picture on the left). To make spaetzle all you have to do is place the grating plate over a pot of boiling water, then fill the box with your dough. When you slide the box back-and-forth over the plate, uniform spaetzle are produced and dumped into the boiling water. The length of the spaetzle is determined by the viscosity of the dough and the speed at which the grating operation is carried out. The German brand Kuchenprofi also manufactures grater type spaetzle makers. These are once again the best in their type you can find anywhere. These devices are made of 18/10 stainless steel, they measure 4-1/2-inch wide by 12-inch long, and are dishwasher safe. You can obtain your own Kuchenprofi grater type spaetzle maker by clicking the provided Amazon product link. A ricer type device (see picture on the left) is a kitchen appliance that can be used to produce spatzle faster and easier. It is typically equipped with a small chamber with holes on its bottom that holds the dough and a lever or handle that is used to apply the top-down pressure. This method has the advantage of accelerating and simplifying the production of spaetzle compared to other methods described above. But these devices are also more expensive. Note that, even though one could also use these devices for the preparation of mashed potatoes, one should not do the reverse and use a device made for mashed potatoes for making spaetzle. The size and shape of the holes required for spatzle are different, and you would end up with globs of dough balls instead of beautiful spaetzle! It is a large capacity spaetzle maker and has a classic layout of holes. It measures 400 x 85 x 110 mm and is made of coated aluminum. It consists of two parts that can easily be dismantled by simply pulling out the fixing pin. The separated parts can be washed in the dishwasher. The handle is flattened, and it has three grooves at the front part that can safely hold on pots of different sizes. It can also be used for purees, mashed potatoes and as a fruit-press. You can obtain your own Westmark Classic ricer type spaetzle maker by clicking the Amazon product link provided here. - Boil 3 quarts of salted water in a pot. - Mix all the ingredients in a bowl and beat them well with a hand mixer until air-bubbles appear in the dough. - Rinse the spaetzle press with cold water before filling (Note: when making lager quantities, rinse the device each time before refilling). - Fill the device's small chamber with some dough. - Press dough slowly into the boiling water, holding the press 2 to 3 inches for short spaetzle or 4 to 5 inches for long spaetzle above the boiling water. 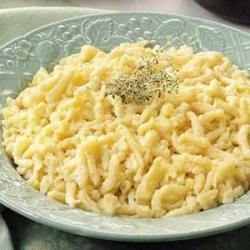 - Skim the spaetzle as soon as they rise to the top, and rinse them in hot or cold water. - For cleaning, immediately after use, rinse the device with cold water.